White River State Park boasts world-class attractions and destinations that offer distinctive experiences for every visitor. Greenspaces, trails, trees, and waterways co-mingle alongside cultural, educational, and recreational attractions across 250 beautiful acres in downtown Indianapolis. The Indiana General Assembly created the White River State Park Development Commission in 1979 as a quasi-governmental agency and it operates outside of the state park system and the Department of Natural Resources. The Commission is composed of the Mayor of the City of Indianapolis, the President of Indiana University, the Director of the Department of Natural Resources, and seven citizens appointed by the Governor for four year staggered terms. Four members of the Indiana General Assembly also serve as non-voting members of the White River State Park Development Commission. The first attraction to call the Park home was the Indianapolis Zoo in 1988 with the White River Promenade as the northern boundary trailway opening before the zoo. The following year, the Eiteljorg Museum of American Indians & Western Art opened its door to the community. 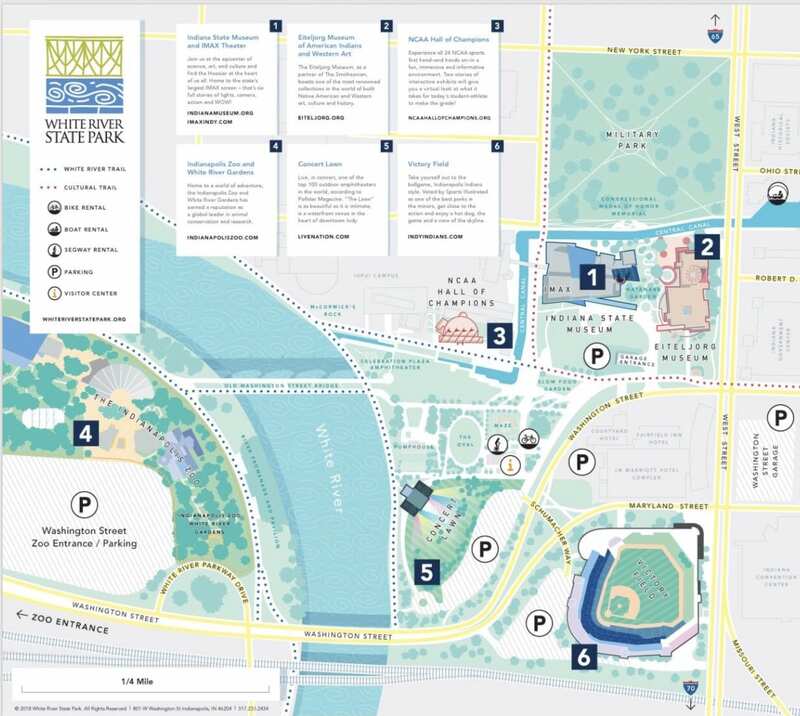 The Park soon became home to Indianapolis Indians Baseball in Victory Field, the state’s largest IMAX® Theater, the NCAA® Hall of Champions Museum and the NCAA® World Headquarters, the Indiana State Museum, and The Lawn at White River State Park (Concert Venue). A unique partnership of the state, city, federal governments, and private businesses constructed viable pathways for both pedestrians and vehicles in the park, including the Historic Central Canal Walkway, Historic Old Washington Street Pedestrian Bridge, Celebration Plaza and other Park specific spaces, and various trails along the White River in the Park.